I always look forward to our reading cuddle time at night, just before bedtime. It's the time when we would choose a book and we read together. Actually, I am the one who reads aloud while Shern will be busy flipping the flaps or pointing to pictures he recognizes, such as animals, star, birds, fish, butterfly, etc. It is the best time for us to cuddle, while Shern sits on my lap. Being such an active toddler, it is amazing that he can actually sit still enough to be enjoying books. 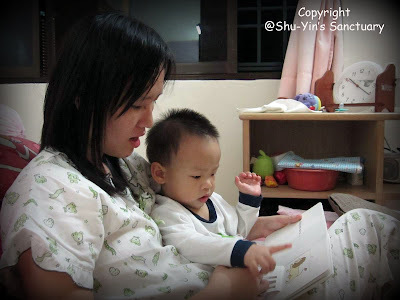 Sometimes, even is it is not bedtime yet, he would bring a book to me, asking to be read. Such a sweet moment.. :) Btw where do u get those books? most of the books i get from Leo Bookstore. but those good books i can find in leobookstore, then i do sometimes buy from mph or borders when there are discounts. i usually like to go for hardcovers because they last longer and not so easily spoiled. but they are more expensive if bought brand new.